After a 9-year hiatus, the biggest indoor metal festival in Eastern Europe - Metalmania, comes back to life! The 23rd edition of this iconic festival will be held on April, 22nd 2017 in Spodek Hall, Katowice (Poland). SAMAEL, MOONSPELL and VADER will perform special sets for their fans! SAMAEL, one of the most innovative bands on the metal scene, characterized by its own unique style. They expand the boundaries of genres and set new standards in metal music. This year SAMAEL celebrates its thirtieth anniversary. The band will prepare a very special set for Metalmania Festival. We will hear iconic songs from their early albums such as Worship Him (1991), Blood Ritual (1992), Ceremony Of Opposities (1994) or Passage (1996), as well as compositions from the new album which is planned for release in 2017! MOONSPELL, one of the most recognizable metal bands from Portugal. Formed in 1992, the band quickly gained cult status. Show in Poland will mark the 25th anniversary of their career. Fans will have a chance to hear songs from such great albums as Wolfheart (1995) and Irreligious (1996). VADER, a cult status band, is one of the forerunners of death metal in Poland. Their eleventh studio album entitled The Empire was released in November 2016. It will be their seventh appearance at Metalmania Festival! Peter, band’s leader comments: "Metalmania returns. I am very happy that I am able to perform again for the best metal crowd in the world! I promise we will have something special for you. See you in Katowice." 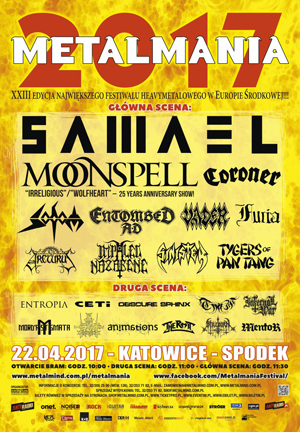 Metalmania Festival - one of the most important musical events of 2017, will be a real treat for metal maniacs! Metalmania remains true to its formula - one day, two stages, over 20 bands from all around the world and thousands of fans! That’s what Metalmania Festival is all about!